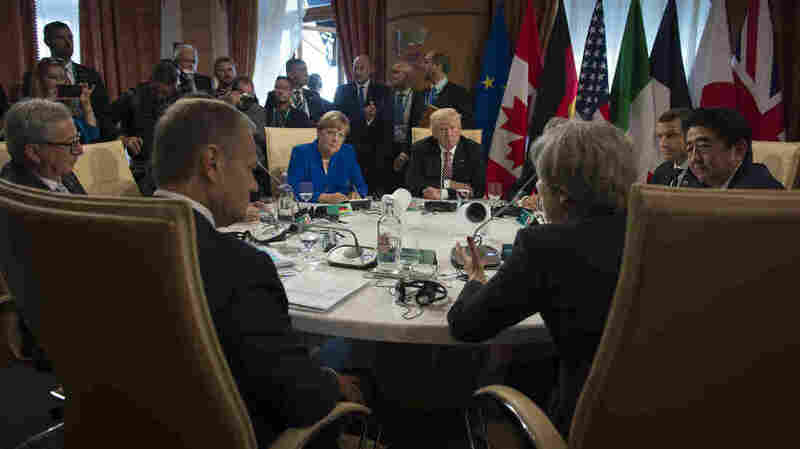 In Europe, World Leaders Try To Change Trump's Mind On Climate Change : The Two-Way It was eight against one, at a table in Italy on Friday: Six heads of state and two EU representatives, arguing with the U.S. president about the urgency of committing to the Paris climate accord. German Chancellor Angela Merkel, President Trump and British Prime Minister Theresa May hold discussions during the G-7 summit in Taormina, Italy, on Friday. It was eight against one, according to German Chancellor Angela Merkel. On one side, leaders of Canada, Japan, France, Germany, Italy and the United Kingdom, plus two EU representatives. On the other side, President Trump. And up for debate, the peril of climate change and the urgency of the U.S. commitment to the Paris accord to reduce greenhouse gas emissions. Merkel said that everyone at the table at the G-7 summit in Taormina, Italy, was urging Trump to stick with the pact, according to Reuters. After that conversation, Trump economic adviser Gary Cohn said the president's views are "evolving" and that he feels "much, much more knowledgeable" after the conversation with world leaders. "He came here to learn. He came here to get smarter," Cohn said. "His views are evolving, which is exactly as they should be." Any decision on climate change would ultimately be based on what's best for the United States, Cohn said. The deal includes voluntary pledges to reduce emissions. It also calls for developed countries to provide billions of dollars to help the developing world switch from fossil fuels to renewable energy sources. The accord was historic in its scope and its ambition, even though its reliance on voluntary pledges made it less robust than some advocates had hoped. But since taking office, Trump has not moved to withdraw the U.S. from the Paris agreement. He has rolled back a number of Obama-era climate change measures, which will hamper U.S. efforts to fulfill its Paris pledges. But he hasn't retracted the pledges themselves. Just this week, members of his administration indicated that the White House had not yet decided what to do on the issue. Before the conversation between Trump and the other G-7 leaders, Italian Prime Minister Paolo Gentiloni noted that all the other countries had confirmed "total agreement" to the pact, while the U.S. commitment was an "open question." "We are sure that after an internal reflection, the United States will also want to commit to it," Gentiloni said, according to the Associated Press. But Gentolini and other world leaders weren't just waiting for internal reflection. They added some external pressure, too. French President Emmanuel Macron reportedly discussed climate change with Trump at length on Thursday at a meeting in Brussels. Leaders of the Roman Catholic Church broached the topic when Trump visited the Vatican. And then there was the chat between the G-7 leaders. Merkel called the conversation "controversial." Cohn said it was "robust." Still to be determined: whether it was persuasive, or consequential. A previous version of this story said 196 nations agreed to the Paris accord. In fact, the 196 parties included the European Union, which is not a nation.